Bhutan is placed in amidst the lap of the Himalayas. 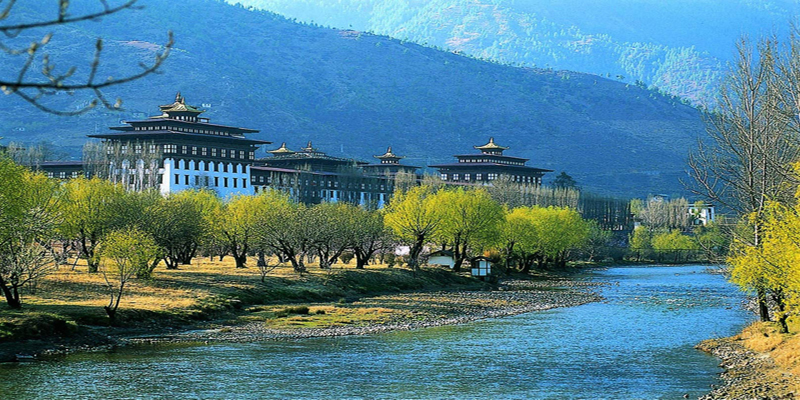 With its capital in Thimphu, it encloses vast physical features ranging from a stretch of plains to a chain of mountains. The origin of the country dates back to almost 2000 BC. The first kingdom to depict Buddhism, Bhutan is peaceful and serene with a religious essence present in it. The country is blessed with innate beauty all over on account of its physical features which majorly include hills, valleys, rivers, etc. With a variable climate of all five seasons, Bhutan invites tourists throughout the year, though in winters, the chill in the weather and snow are of major interest. On account of being a hilly region, the country is considerably covered with forests which make home to a wide variety of fauna, the Takin which is its national animal being exclusivity. The kingdom of plants is equally wide and interesting. The Royal University of Bhutan is however an important feature of the country as it is the sole centre for higher education there. Bhutan is well accessed to air, rail and road transport. It entertains a blend of musical relief, a wide ranged cuisine and a number of sports which recreate both natives and visitors alike. The folk dances and the religious festivities add on to the colours of Bhutan.